I can feel it. The crows can feel it. The coyotes howling at the sliver-of-a-moon, they can feel it, too. The sap is rising, the air is downright balmy at a mid-day forty-five degrees in these northern woods, and you can almost taste the snow that is melting in this season of melting snow. You don’t have to be a red squirrel to feel squirrely in mid-March when springtime begins its annual release. It’s a squirrely time of the year — and what do you do with all this squirrely energy? How do you grab hold of that quivering seed of an idea and call it into focus? I’ve been pondering these questions this past week since returning home to Michigan’s Upper Peninsula from two trips over the past month, one to New York City to visit my cousin Abby, the milliner, and the other to Idaho to visit my grown sons and their families. The seeds have been quivering inside of me for sure. In my nighttime dreams, my belly is round and I am pregnant, ready to give birth, and, in the morning, I wake up filled with momentum, eager to move forward with a book I am planning to write. There is no denying the eagerness. It’s there. Except, in the days after my return from from the last trip, my eagerness found itself stuck in the melting slush. The structure of the book hadn’t come into focus yet; it was still a blurry image in the developing tray of my psyche, a baby in utero. And there I was skittering about like the red squirrels with all this springtime energy, asking myself: What is a gal to do when she’s feeling skittery and unfocused and eager beyond eager to move forward? And some answers did start to rise up. “Sequester yourself for an hour or so each day in your creativity room and putter with your unfocused project or putter with anything that strikes your fancy,” my inner guidance instructed me. “And skate-ski on that crusty layer of springtime snow. You know that makes you feel like you are flying!” My guidance continued. “And watch The Voice!” My wise woman was getting downright bossy now. But what the heck. It all sounded fun. I love to putter and I love to ski. And The Voice, well I had reason to jump on board and join the millions of fans who immerse themselves in this television show that brings to the national stage musicians of amazing talent. My friends’ son Josh is a contender this spring and I have been a fan of his music for over a decade, and now here he is nurturing his own quivering seeds into fruition as he sings his heart out on a high vibration stage. So that’s what I’ve been doing. Even on the busiest days, I’ve been stuffing myself into my creativity room, closing the door, and allowing the inner muse of the moment to guide me. One day, I found myself cutting and pasting a vision board collage for this new season. Another, I organized the materials that I have been accumulating for this book project into neat and tidy pockets in a binder. The next, I wrote two letters, on vibrant and fun cards that I had bought at the Moscow, Idaho Food Co-op the week before. And then there’s the skiing; that one has been easy. There is nothing as glorious as skiing in your shirtsleeves as you fly along a corn-snow trail with a balmy wind blowing through your hair. And it has been fun allowing The Voice’s upbeat breeze to blow through my hair as well. It is inspiring to witness such musical talent, uplifting to watch the coaches offer positive genuine feedback. In fact, my inner wise gal was so impressed by coach Pharrell’s wholehearted and sweet approach that she started ordering me around again. “Google Pharrell,” she commanded. “You’ll find something worth your while.” And that’s how I found the his interview with Oprah, the one taped shortly after his forty-first birthday. My inner voice is no slouch; she knows what she’s talking about — the interview with Pharrell was a gold mine for me. Oprah spoke about the resounding world-wide success of his award-winning “Happy” song and asked him to share his process for writing it. And his response was what I needed to hear at that moment. He wrote nine drafts of the song, thinking it out, trying to make it make sense as part of sound track for the movie Despicable Me Two. And none of these drafts felt quite right and he found himself struggling and frustrated. And that’s when he gave up; that’s when he had nothing left in him. And that’s when the music began to flow, simple and easy. And that’s when the words came to him, pouring in from this place of nothingness. 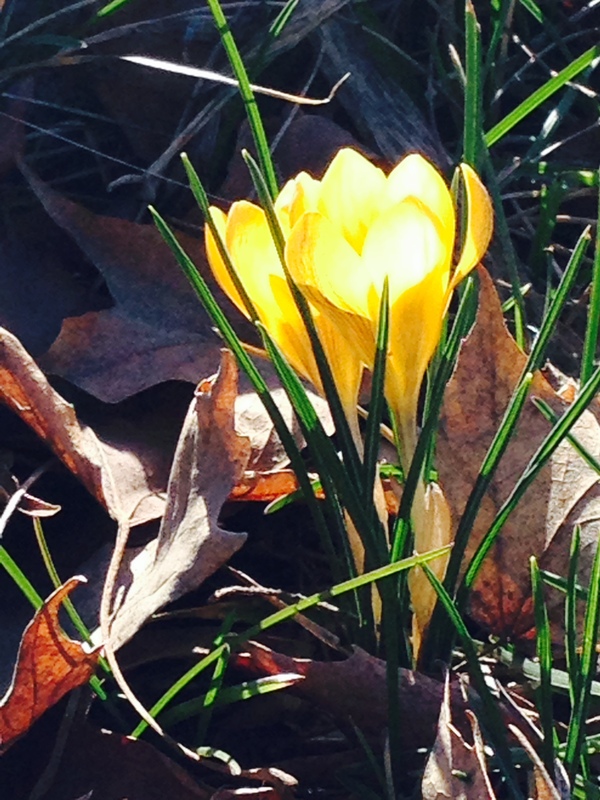 Spring arises from winter’s release. It happens every year. Without our forcing. Without our struggling. The sap rises; the seeds, they crack open and sprout. And my project? Well, clarity came to me, last Sunday, while skate-skiing around Blueberry’s Wolverine Trail, on the second lap as I breathed in the scent of balsam and a happiness in the melting-snow air. I knew the next step. I knew how to write an introduction. And later, in the car, on the way home, the form of the book took shape, and then the title came tumbling in and an image for the cover. Just like that my path was cleared of slush and I was moving forward with focus and momentum. Just like that spring had sprung and I was breathing it in.